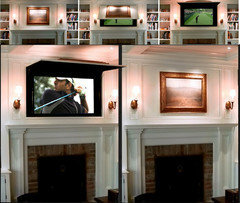 cost/difficulty of built in TV/fireplace - I love the concept of the built in shelving unit that contains the TV and fireplace...can you tell me if this is very complex to build and approximate cost range? ahutzler1014- the project took 2 sheets of plywood, 1 can paint, and 4 tiles + 5 sheets for backsplash above fireplace, and grout. 1200$ Biggest cost was electric fireplace and surrounding cabinet. What is the trim color? Can you suggest a lighter option too? Another option to consider is TVCoverUps. 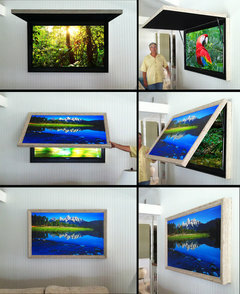 Framed art or panel provides the focal point of the room, with the hidden TV and entertainment consoles beneath. Walls - Paint color of blue walls please? Hi Garrison, Gorgeous room! Like others, I'm trying to replicate the dimensions of this lovely builtin. 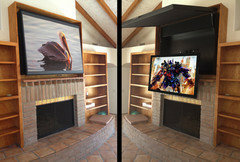 - Do you think the space to either side of the fireplace unit is about 12", and then the bookcases are each about 18"? Do you think those bookcases would be too small at 12", or maybe 15"? 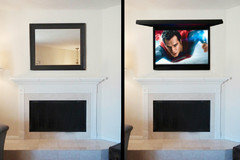 Just trying to squeeze something like this in as it would really change the look of our gas fireplace. Thanks so much. Too bad I didn't do more research earlier on. It looks like the 23" model works well. Ours has a 32" front so we lose some of the space to build in the bookcases. Appreciate your help! Meg I like these colors. For Tay's room. That accent color would be great in ker bath. The comforter at the end of the bed? - I love the yellow floral comforter at the end of the bed. What is the brand name? Thanks! I also want a quote for this entire built in. Thanks. Looks beautiful! Contact your local cabinet shop to get pricing. What is the wall color of this room? 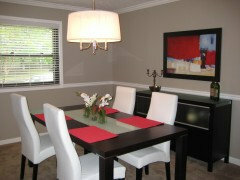 We used Navajo White, Benjamin Moore. Blinds... - I saw that the wood looking blinds came from 3 day blinds, but can you tell me what the color/ style is? Thanks 3 Day Blinds, very kind of you to say. This is a beautiful room. I am wondering what type of fireplace that is? Vented? Electric? Natural? We are hoping to do a similar built-in with fireplace in our bedroom, but venting would be very difficult. Thank you! What brand of fireplace is pictured? I do not have access to the details of the fireplace. fireplace - what brand/model is it? It was actually a cream color, maybe your monitor has a different color hue...I believe we purchased it through Macy's or Neiman Marcus. Love the fixture. Where can I find??? - Ceiling fixture.. Where can I find? There is a similar one at Lowe's. Chris do you have a link to the one at Lowe's? I really want to try to find something like this and am having trouble! Coverlet - Where can I get the coverlet? the coverlet/ comforter are from Macys...i just saw them there today! Its Calvin Klein "Poppy", on sale at Macy's! Can you tell me the manufacturer or where I could find the chandelier. Beautiful room. Thank you. i have the same one and got it at Crate and Barrell. Where can I get the quilted bedding? This is a platform upholstered bed. Our records show it was purchased from Crate & Barrel in 2009. I love the built-in. Can you tell me the colour of the paint on it? Check out the small green tags that contain information like this: Navajo White OC-95 Paint by Benjamin Moore. any detail on source of light? I do love the chairs. Where are they from? The chairs are from Williams Sonoma Home, I believe they were called the Bedford Chairs. I really like the chandelier. Where is it from? bedspread - Can you tell me where to purchase the off white bed cover? This project was completed in 2009, I doubt you'll find the decorative furnishings in stores. I believe it's Calvin Klein 'poppy' comforter - and it's still available at department stores. Love the ceiling fixture! Who makes it? Thanks, take a look through previous threads on this photo and you'll see this same question has been answered. Simple and elegant light, what vendor? 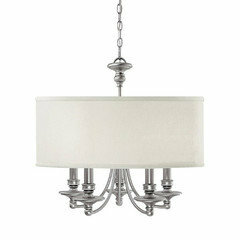 We have a couple different Manufacturers that supply this type of Chandelier. Available in different sizes and Finishes including Chromes and Nickels. Let us know if you'd like more info. I believe we ordered this light from Crate and Barrel. love the comforter at the bottom of bed. Who makes it? Custom material? It was from the home department in Macy's. Trim and Ceiling - Hi! Does anyone know the trim and ceiling color? Valspar's Retro White is a similar color. Click on the small green tags on the photo to see the actual colors used. my fireplace is creek stone a gray color, my trim is white, the kitchen is near and the cabinets are cherry, should I do built ins next to fireplace, black or white? I love the white...looks spacious and allows your personal items to shine! If you paint the cabinets near the stone fireplace a really dark grey (not a true black) it might help ground the fireplace and give it some more presence without being a stark white. what a beautiful room! clever deisgn with the bookcase an fireplace - may i please ask the approximate cost to uild something like this and could the fireplace be a two way into the bathroom on the other side? thank you very much! I would show this to a professional contractor in your local area and maybe they can walk you through some ideas and cost estimates for accomplishing some of your ideas. I'm sorry we don't have the shop drawings on this piece that define that measurement. I don't have the specifics from the window package on this project. ceiling color - Did you exactly match the ceiling color to the crown molding or did you just tint it to coordinate? The color is the same as the trim but in eggshell. The carpet is a Godfrey Hirst style that has been discontinued. These are inside mounts and we did not use a border...similar to these as well. 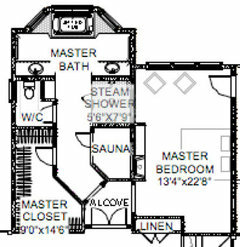 Dimensions of master suite - This room is very cozy and inviting. What are the dimensions of this room? Thanks so much, sorry for the delayed response. Head of bed - Do you have any photos of the headboard/ top of bed? Thanks! Yes, it is the next in the series. Check this link out. Fireplace - Can I have manufacturer and model of fireplace. I am building a house and need it soon if possible. Also dimensions. We do not have the specifics on the fireplace. Love the built in - My friend and I have bought a house to "flip" and would love to build this unit. Is there a blueprint of it?? Thank you in advance! Glad you like it...we do not have a shop drawing. Start with your fireplace insert size and depth and then fill in your remaining space with bookcases? Does having the TV above the fireplace not affect the TV in any way.We are wanting to use a gas fire. Your city or county will have guidelines in their building code that will restrict how close the TV can be to the fireplace, your manufacturer of the gas fireplace will also have guidelines for placement of mantel, etc. Toothfairy, hover your mouse over the photo and you'll see the small green tags that highlight certain elements of the room, the paint color is one in this photo. Also if you look at the previous questions on this room you'll see that this question was already asked and answered. Have fun with houzz.com. what are the dimensions of the built-in. Sorry we do not have the shop drawing with the prescribed measurements. Trim, moulding and wainscoting - What is the style of trim and wainscoting used for the built in unit as well as the hallway? And who sells it? Check with your local suppliers, each region has their own providers. Godfrey Hirst Australian Wool was used in this home. What is the picture of to the right of the bookcases? - Is it 3 girls? Can you tell me the artist? Thanks! Yes, it's three women dancing on the beach in old time bathing suits...was in the client's collection, a reproduction. Would you please let me know what the depth of the bookcases are? Also is the TV free standing? Thanks for your help, I love the room. These would normally be 12" - 14" deep. Thanks for your inquiry Dmorrison, I don't have access to the archive blueprints at the moment but I'm thinking the bedroom of the master suite wasn't huge 16' x 18'. Hope that helps with scale. Where did the window coverings come from (the rattan/bamboo shades?) This is lovely! Thank you! Thanks so much. These shades actually came from 3 Day Blinds. Fireplace - Can you tell me the make / model of this electric fireplace? How deep is built in and fireplace? - I want to replicate this bedroom in the custom we are building. Can you tell me how far the built in sticks out from the wall as well as the fireplace? With the fireplace, do you know if it goes even further back into the wall than the built in and if so do you know the depth requirements to install the fireplace? Thanks so much!! Where do the drapes come from? The color of them? Cabinet Hardware - Lovely! How to find the lower cabinet door knob hardware? Thank you. Wallpaper - Is it possible to put wallpaper over wall paper,I need to take off wall paper .or is there a solution to take it of. Thank u.
what is the wall color paint? Woven woods, company, shade name, pls? - Did you use black out liner? Room dimensions - Can you please tell me the dimensions of this room. 9. Wouldn't we all want a fireplace in our dream bedroom? If your home wasn't built with one, they now make some very realistic gas fireplaces that don't even require venting. If there is not much space on one side, go for skinny built-ins instead. Light that fire. More exciting television screen picks abound. I often turn on all the lights in my bedroom and enjoy ski racing from my bed, don't you? Anyway, the blazing fire adds to the ambiance, and closing the shades here keeps the view outside from distracting from this calm and serene bedroom. Well, it's calm and serene until a skier crashes. Tell us: Where would you choose to freeze the TV screen? Let us know on our Facebook fan page (and see what everyone else is saying). lLike the style. look of this set up, but not sure if this opening for fireplace sits high enough.